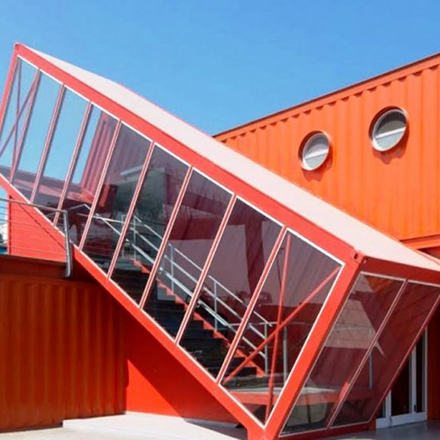 Over the past decade re-purposed shipping containers have become synonymous with creativity, innovation, exciting new start-ups, regeneration and new beginnings. Ahead of the launch of our own Cardiff Containers, we take a look at some of our favourite shipping container projects from around the globe. 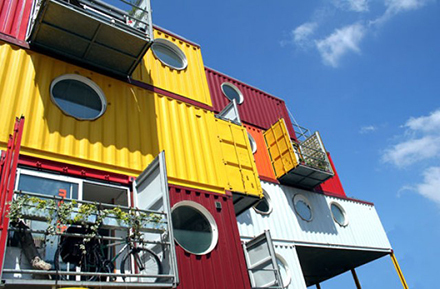 One of the very first re-purposed shipping container projects and still one of the most distinctive. Container City II is part of the Trinity Buoy Wharf arts quarter in Docklands, East London. 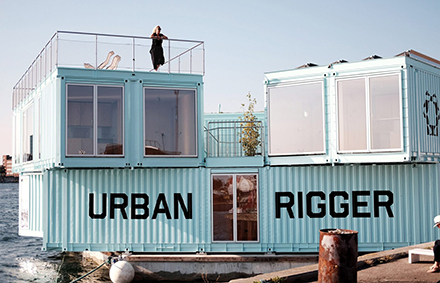 It opened in 2002 and pioneered the use of shipping containers as affordable studios and workspace for creatives. 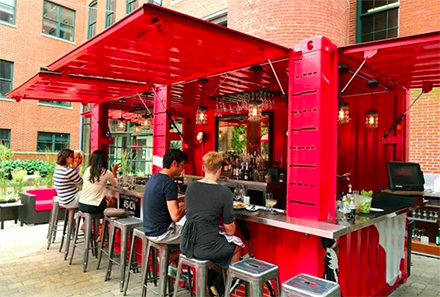 Boston hipsters, baristas and entrepreneurs readily embraced the DIY, cool factor of shipping containers. Customised shipping containers started popping up all over the place and being used for everything from offices to mailrooms to urban farms. We love the ingenuity and laid back vides of this neighbourhood bar, in trendy arts district South End. This Hall & Woodhouse bar and restaurant is situated right on the waterfront at Portishead Quays Marina. We love its industrial interior fit out and the fact that the containers draw on Avonmouth’s shipping heritage. 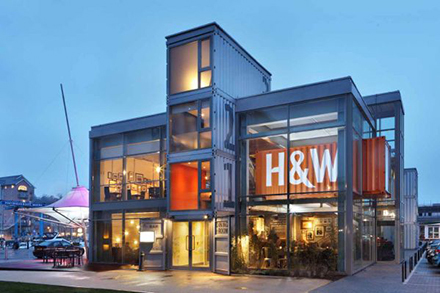 The development is constructed from 28 recycled shipping containers that were provided by Container City™ and the project won the New Build award at the Campaign For Real Ale Pub Design Awards. 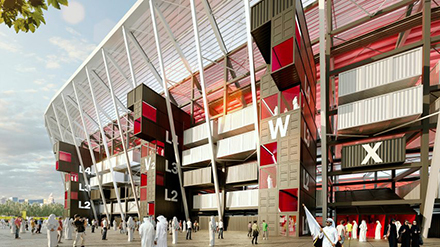 In November last year organisers of the 2022 world cup in Qatar announced that one of the 40,000 seater stadiums would be constructed out of…you guessed it…shipping containers! Designed by Fenwick Iribarren Architects, the modular system can be taken apart and re-assembled after the tournament, so it can be moved elsewhere, recycled and repurposed instead of being at risk of sitting dormant and empty for years post World Cup. It’s also a much greener form of construction then the norm. Bravo! 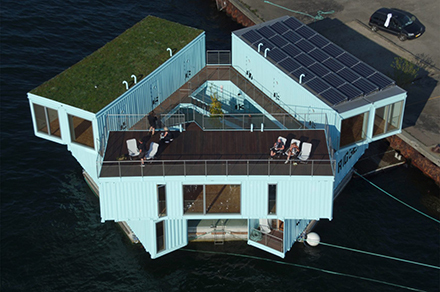 These absolutely amazing re-purposed eco-friendly containers house lucky students in Copenhagen harbour. Designed by Bjarke Ingels’ firm, the project is called Urban Rigger and aims to provide low-cost, sustainable housing for students in the centre of one of the most expensive cities in the world. Nine shipping containers are angled with their ends overlapping to frame a shared garden in the centre of the floating platform, with the roofs of the units hosting a terrace, solar panels and grass. Boxman Studios create immersive, experiential environments for brands, retailers and restaurants. 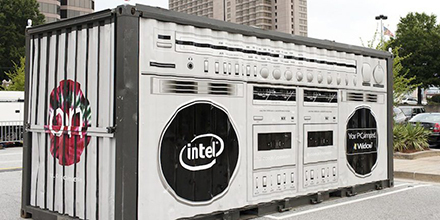 They used industrial containers for an impactful brand activation for HP, transforming six containers into gigantic boom boxes. They branded the units, popped them up in cities across the US overnight and kept them closed as part of a two-day teaser. With anticipation built, they opened them up for all to enjoy, revealing a lounge space, interactive wall spaces, art and a DJ booth. 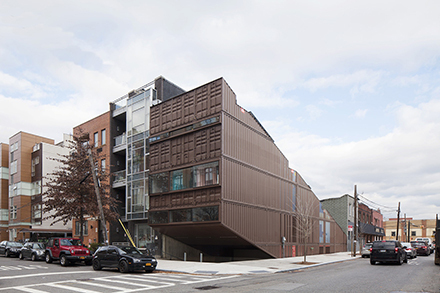 NYC based architecture practice LOT-EK have done lots of interesting things with reused containers over the past decade. 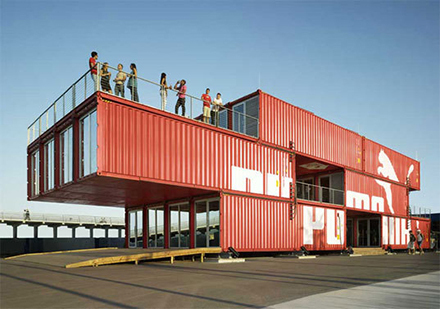 In this commission for Puma, back in 2008, 24 containers were put together to create a three floor retail space, including a bar and terrace. But this is no ordinary pop-up. This one is completely mobile and can be easily transported to new locations and assembled quickly. 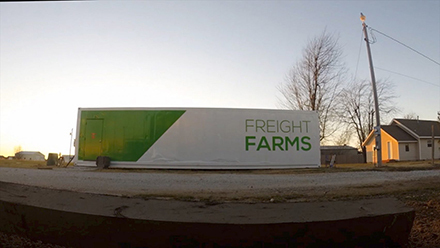 This is the most genius idea we’ve come across for quite some time – a ready made farm-in-a-box built entirely inside a 40 foot shipping container. 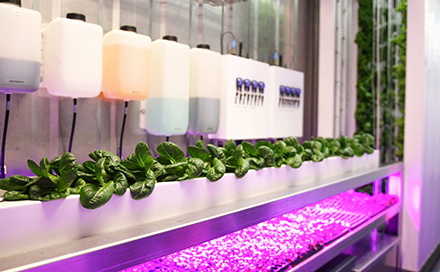 Through cutting edge hydroponics’ technology, start-up Freight Farm’s Leafy Green Machine™ can yield as much food as a 2-acre plot of land, all from just a 320 sq ft footprint. The large, moveable containers mean that food cn be grown anywhere and outfitted with all the tools needed for high-volume, consistent harvests. With innovative climate control technology and growing equipment, the perfect environment is achievable 365 days a year, regardless of geographic location. Eco-friendly, sustainable, affordable housing is top of the agenda for most councils and developers. Shipping containers offer a great solution for all of these issues, and so new, radical residential accommodation is popping up all the time. This amazing Brooklyn container house, designed by LOT-EK, is not your typical family residence but we love it’s aesthetic. The 21 shipping containers its constructed from have been cut diagonally creating a modernist, monolithic shape that both stands out from and complements its urban surroundings. This playful office complex is situated 40 km south of Tel Aviv on the seafront. Designed by Potash Architects, its fun, low-cost and conceals the offices and event space within. Our reason for choosing this one as our last favourite is that staircase – wow! Meanwhile House Cardiff Containers launch in May 2018, with 14×8 ft units costing just £250 month. Come along to our Open Day on Thursday 17 May to take a look around, or contact max@meanwhilecreative.co.uk to enquire about availability.